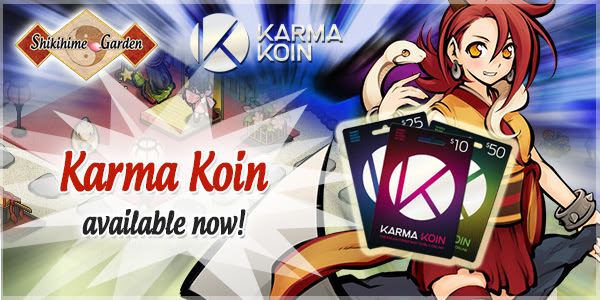 Appirits Inc. recently announced that they will begin to accept Karma Koin, a prepaid card solution provided by Nexon America, for in-game purchases in their latest English browser-based game title – Shikihime Garden. Available in denominations from $10 – $500, Karma Koin can be purchased at thousands stores in the United States, Canada, Mexico, Australia, and New Zealand. The unique aspect of the payment service is that 1% of all purchases made with Karma Koin are donated to charity. Appirits believes that their collaboration with Nexon America and Karma Koin will give Shikihime Garden’s players a new payment option to enhance their in-game experience. And most importantly, Shikihime Garden players will make a positive influence in the world while buying what they want.